UCCFS: Beef Stew vs Shepherd’s Pie Round 1 – I Love It Spicy! This is going to be another toughie as we have 8th seed Beef Stew going against 9th seed, Shepherd’s Pie. As I am writing this, I really am not sure what to choose as my winner. I have had some big hit and misses for both dishes. 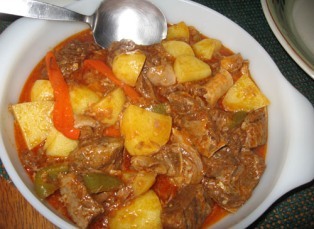 The top beef stews are chock full of flavor; the meat is so tender and the vegetables are so cohesive with the dish that every bite gets a bit of everything that you would want. Some love big chunks of meat, some love hearty-sized vegetables and then there are others like me that want everything in smaller portions on my fork. I love to be able to stab a carrot, a bit of potato, some mushroom, celery and onion with my bite of beef. I love the whole experience. In the past, I have put my own spin on it using pineapple tidbits for a sweeter side to the dish. As for Shepherd’s Pie, when the pie is right on, the mashed potato topping is like a present wrapped around another present beneath. You would think that the meat and vegetable filling is what you really want when you eat the Shepherd’s Pie, but it is the combination with the creamy potatoes on top that wins you over. It really is like a beef stew underneath, but there are so many slight variations that isn’t always true. 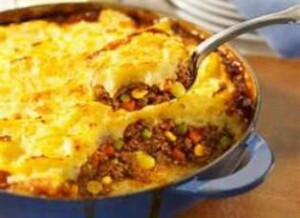 In the US, Shepherd’s pie uses beef, while in the UK, they use lamb. So depending on where you grew up, we might be talking about two completely different dishes. I grew up with beef stew, eating it every one or two weeks and even helping my mom as a kid making it. It may be the ultimate food for me when it comes to something that makes me feel “comfortable” and like I’m back home. It wasn’t until I was in my late teens/early twenties when I first tried shepherd’s pie. The lightly browned top and creamy underside of the potatoes won me over and thought it was a no-brainer of an addition to beef stew-type ingredients. So sorry, Mom. As much as I loved your stew, shepherd’s pie narrowly beats it out. never had shepherds pie. sounds good though! I tried to put a sheppherd in a pie once. He resisted.